Hey everyone! Yes: I am still alive =) !!! I know it’s been months (almost 3 to be exact *blushing*). A lot has happened between my last post and now, including my 3rd collection called Woodland Rose. 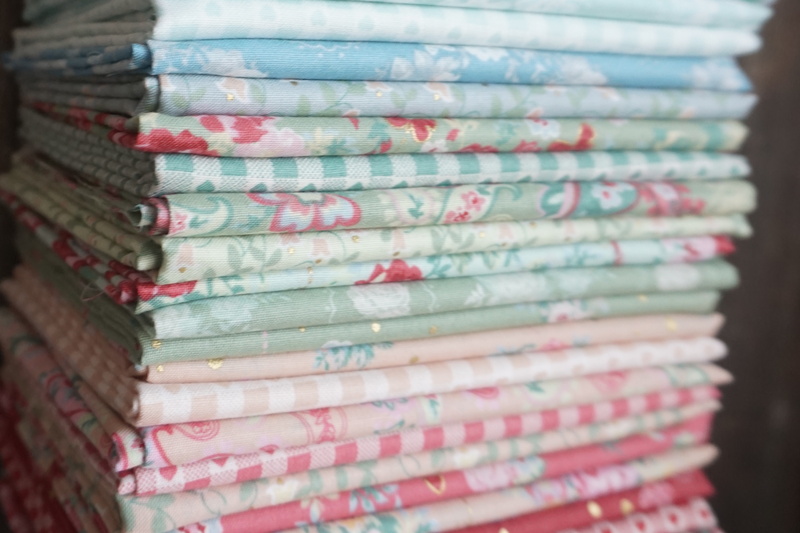 I’ve been a busy bee sewing in preparation for Spring quilt market. 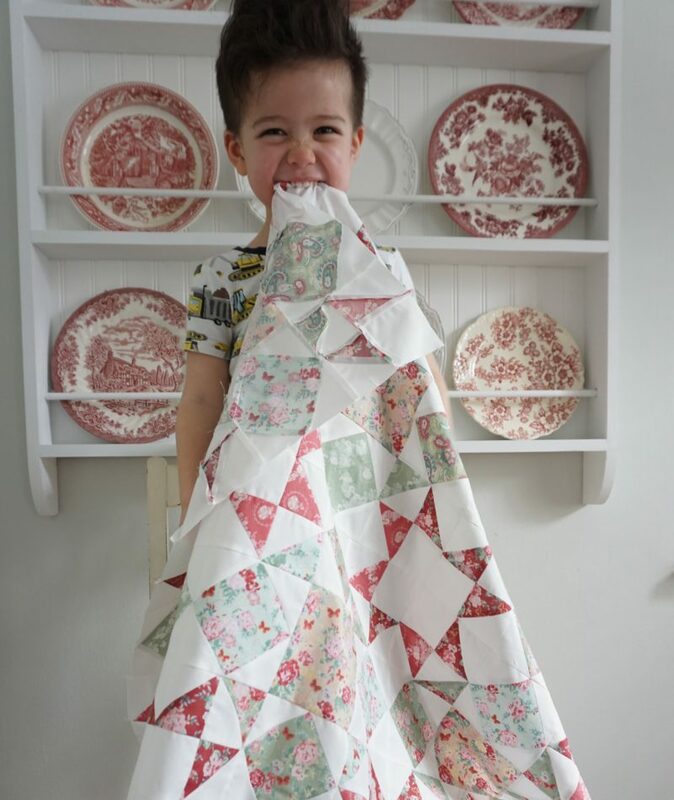 In this post I’ll show you two quilt tops that i’ve made so far. Be prepared for a photo overload! That’s what happens when I haven’t posted in months. I named this collection after a rose garden adjacent to the Woodland Park Zoo in Seattle, Washington where I frequently visit and explore with my two boys. The evergreens/sage, deep reds and blues remind me of rainy and cold Fall days at the garden. Whereas the softer pinks and yellows and butterflies remind me of warmer, Summer days. I hope my collection can bring this special rose garden that I often frequent to your fingertips. It’s hard to tell in photos, but similar to my last collection, there’s some gold metallic in the fabrics surrounding the butterflies. I took over a hundred photos of my fabric to try to capture the metallic sparkle because i’m crazy like that. Still it’s hard to see, lol! I’m tellin’ ya…you just need to touch the fabric first hand and see for yourself. Here’s a photo of an almost completed quilt top that I made using Woodland Rose. I love sharing with you all free patterns, so you can expect this pattern for free on my blog shortly after May. 🙂 I will of course do a post and let you all know when it’s available. 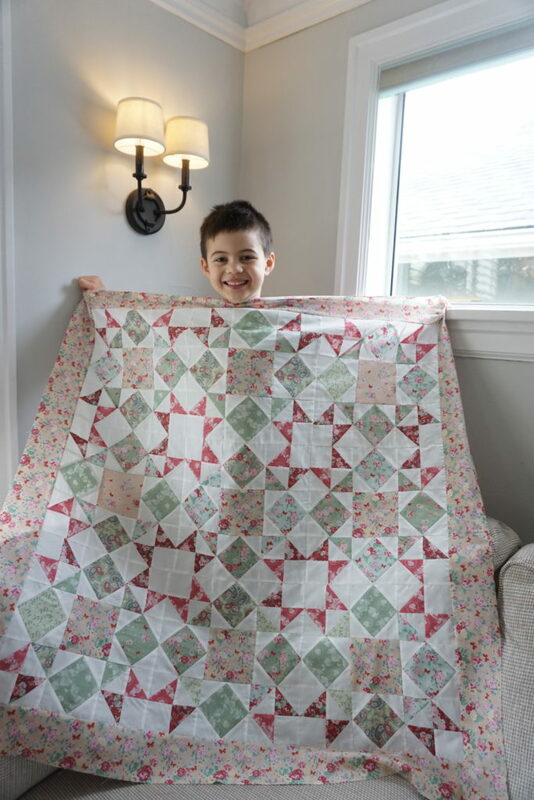 The best part of making a quilt is having my sons model it for me x-) How lucky am I to have such handsome quilt models!? 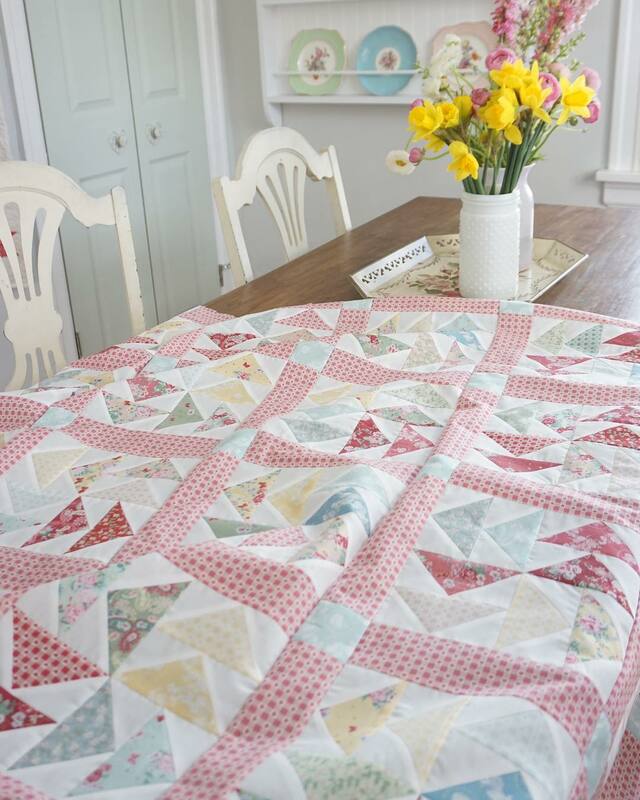 Here’s the 2nd quilt I made using Woodland Rose fabrics (above and below). Since this collection won’t be available until Fall 2018, I decided to make a Christmasy-ish quilt using mainly reds and greens. 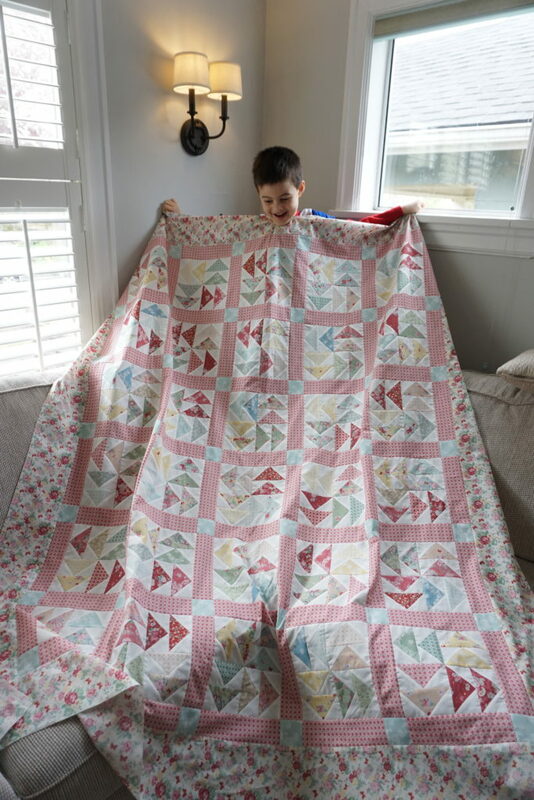 But then I loved how this wall-hanging quilt turned out so much, that last minute I decided to add some champagne pink to the mix to make it something I can hang year round. 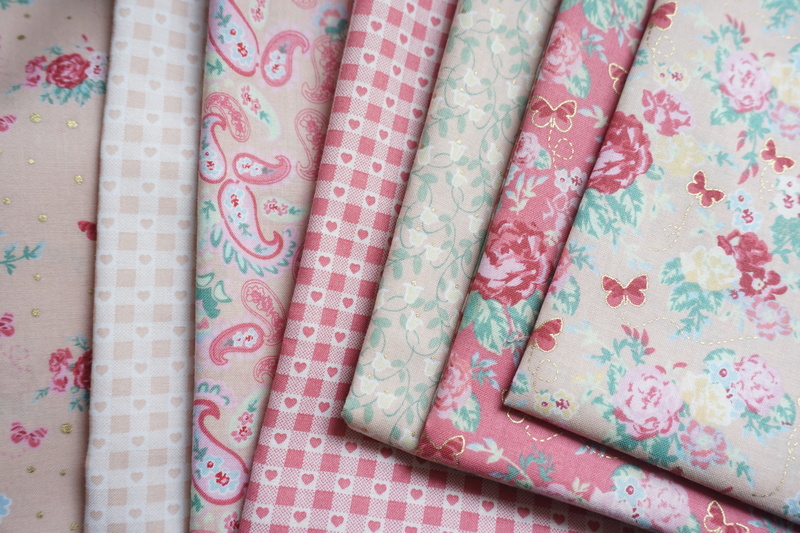 Woodland Rose is a versatile collection that works well for all the seasons! You’ll notice that’s on ongoing theme with all my collections. 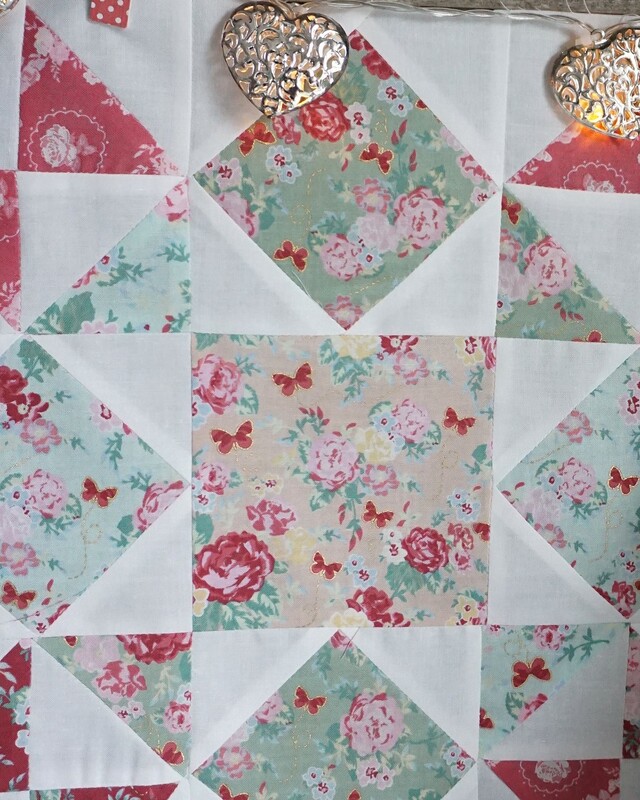 You can find this pattern on page 113 of my 2nd book, Quilt As-You-Go Made Vintage. I couldn’t post this without some photos of my furry child as well. 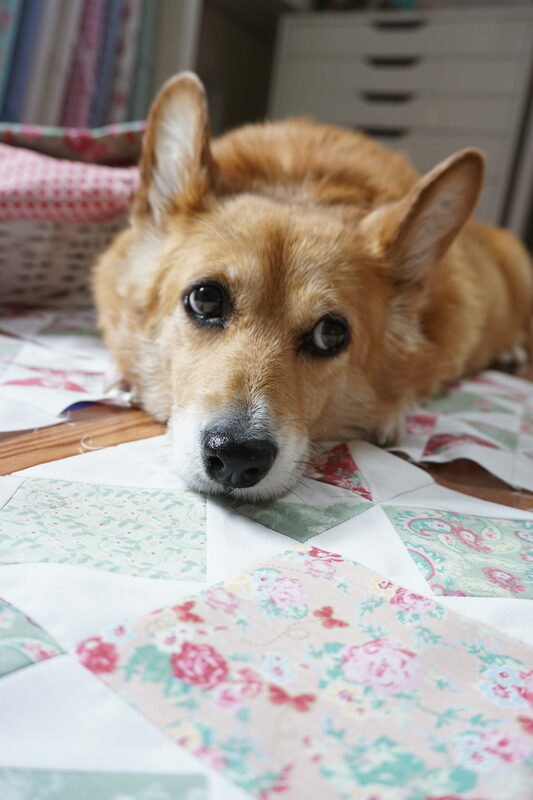 Paige is always loyal when it comes to making quilts. She never leaves my side. These past months we’ve been doing a lot of quilting in the rain, which is actually my fave time to quilt. 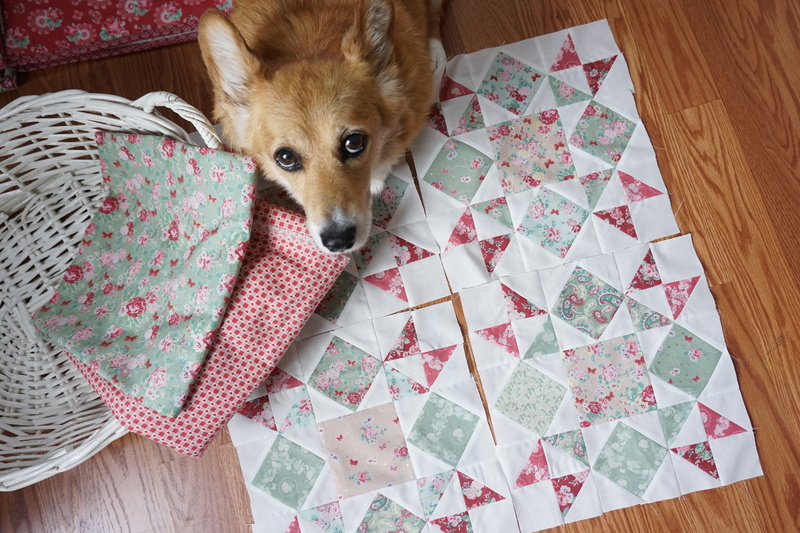 And even when I lay a quilt out for her, she prefers to lay right on my unfinished quilt blocks. 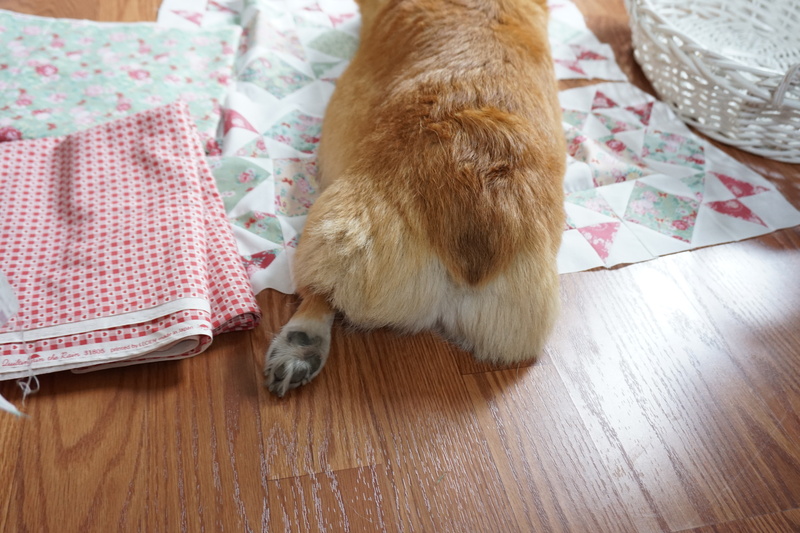 This quilt will be named “Stop and Smell the Roses”…unless I can think of a better name. Anyone have any ideas? My last post was January 30th…since then my eldest son turned 6, Easter came and went as well as Spring Break which ended for my boys yesterday. 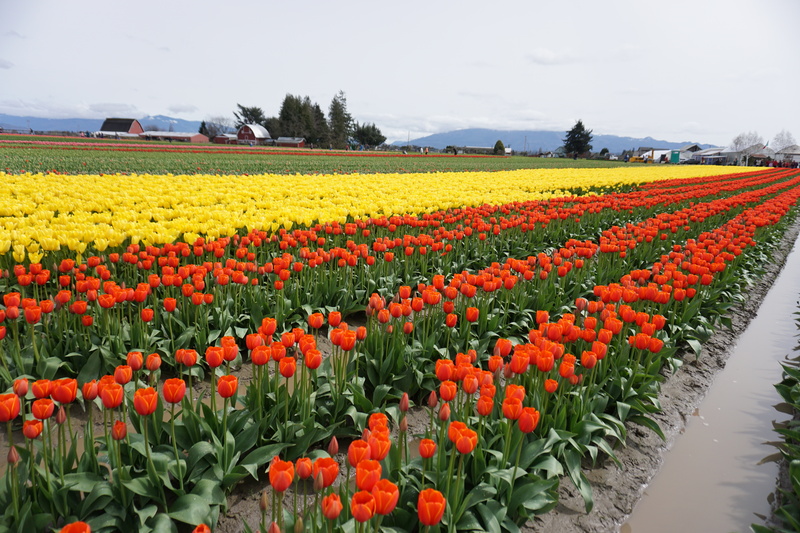 During break we visited the tulips in La Conner (the little town I named my 2nd collection after). Squinty eyes above because we got one day of sun and us Seattleites aren’t used to that big glowing ball in the sky. I know this isn’t really quilty-related, but I can’t NOT share these. My Spring break ended with my husband and I moving my sewing room up to the attic. See the mess below! *whimper* I have a lot of organizing to do. 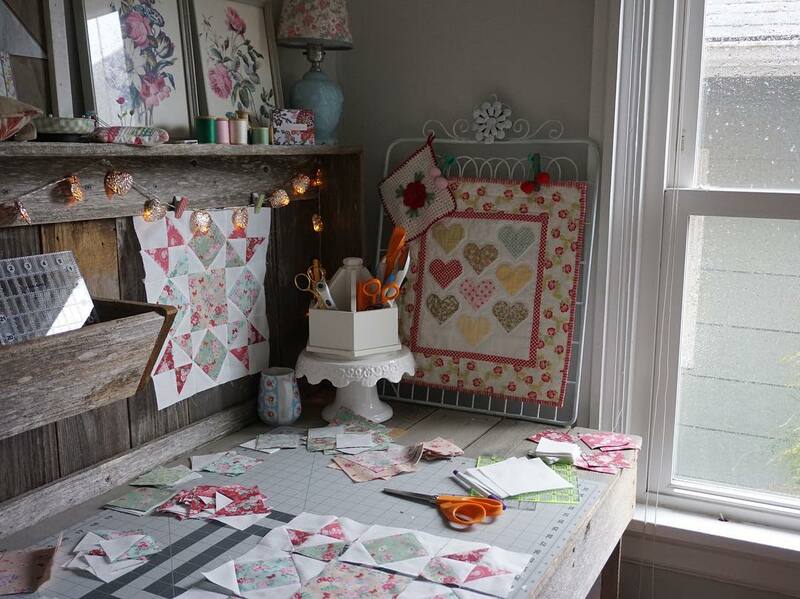 I’m excited to make my my attic a magical quilting space. I will be sure to share photos with you when it’s all finished. Also, note that my little online shop is temporarily closed. It will reopen after my space is organized and after I cut a bunch of new fabric bundles for you all! These are bolts from my 1st and 2nd collections, High Tea and La Conner. I need to sell it to make room for my 3rd and 4th collections coming in. What was my sewing room is now my boys bedroom. 🙂 After my hubs and I spent a whole day moving rooms, we built this bunk bed for them. These smiles make it totally worth it! 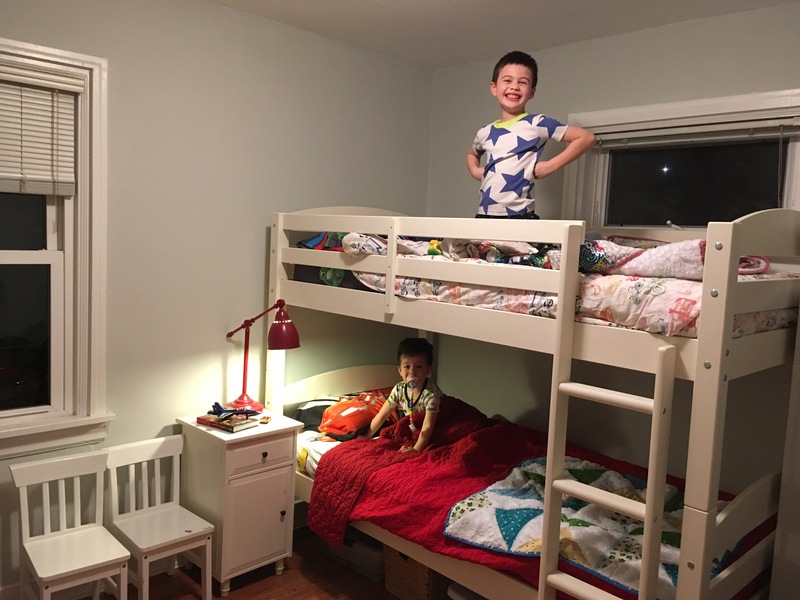 Words cannot describe how excited they were to get a bunk bed. Last but not least, it seems only fit to leave you with Paige’s fluffy ba-donka donk. Because who doesn’t need a reason to smile on a Monday? 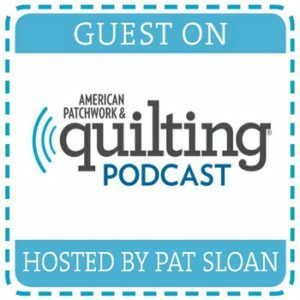 Absolutely gorgeous collection and fabulous quilts. Hope the collection will be available in Australia postage is very expensive fron the states and a bit slow when you are impatient. Beautiful boys. Thank you sew much! 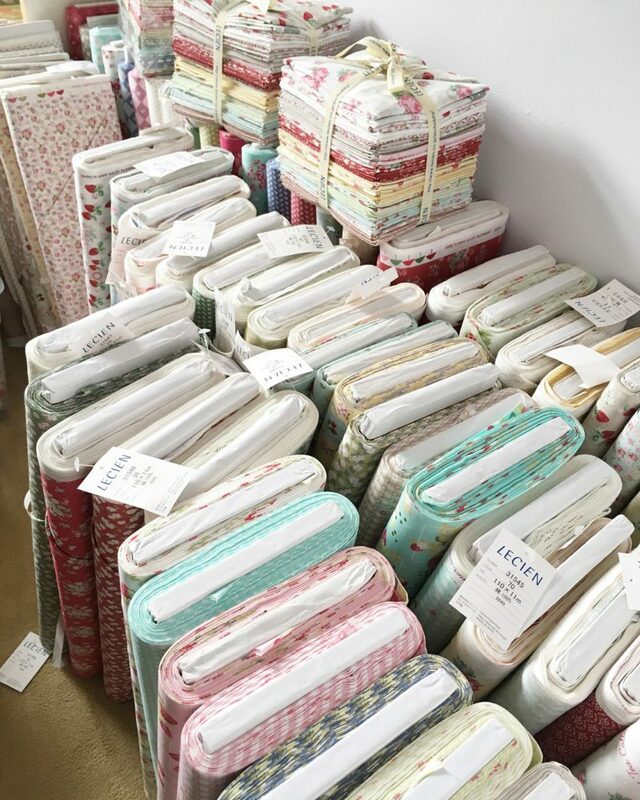 Lecien sells to international vendors including Australia, so as long as your local quilt shop knows about it and orders it, then it can be available to you. 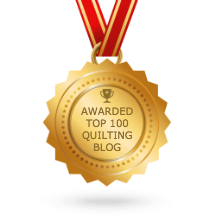 🙂 Happy quilting! Paige is adorable! I think you should name that quilt pattern, “Paige stops and smells the roses.” Or some other name that honors her. 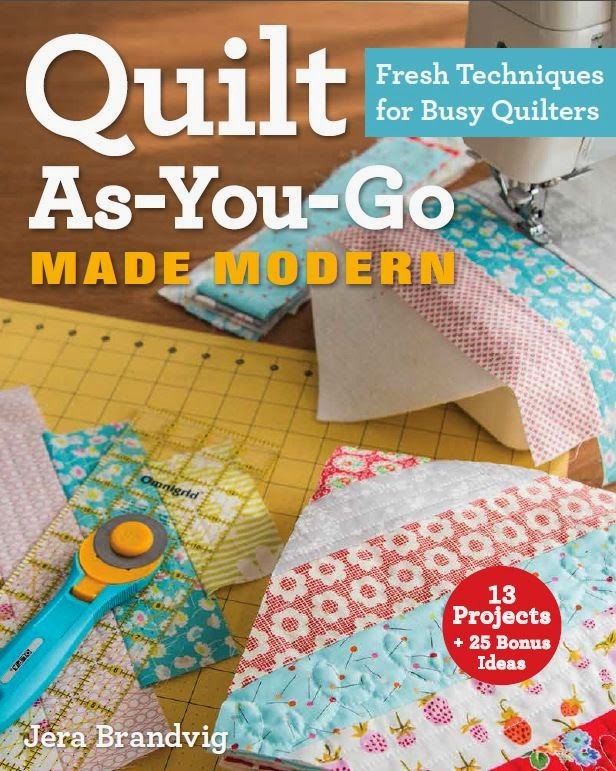 I’m still a quilting wanna-be, because I only know how to sew by hand, but love your books and your fabric. 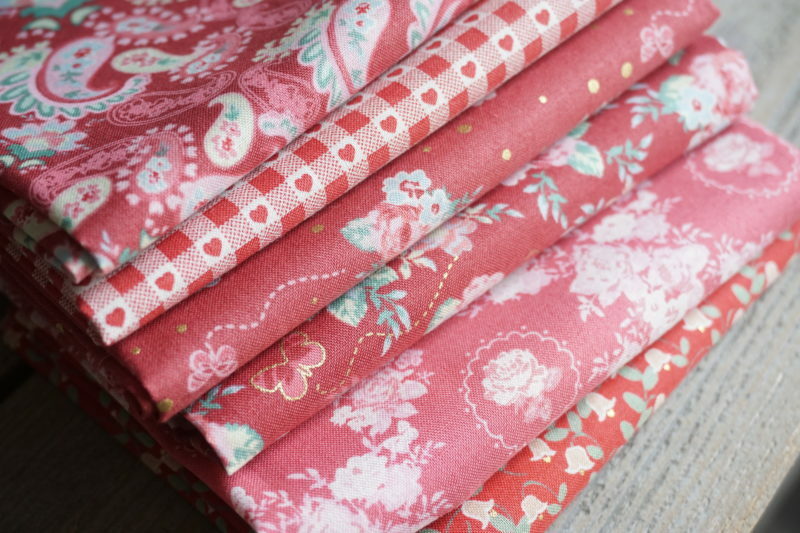 Glad I live in the same area so I can shop at Pacific Fabric. I always love your posts! You’ve been a busy girl! 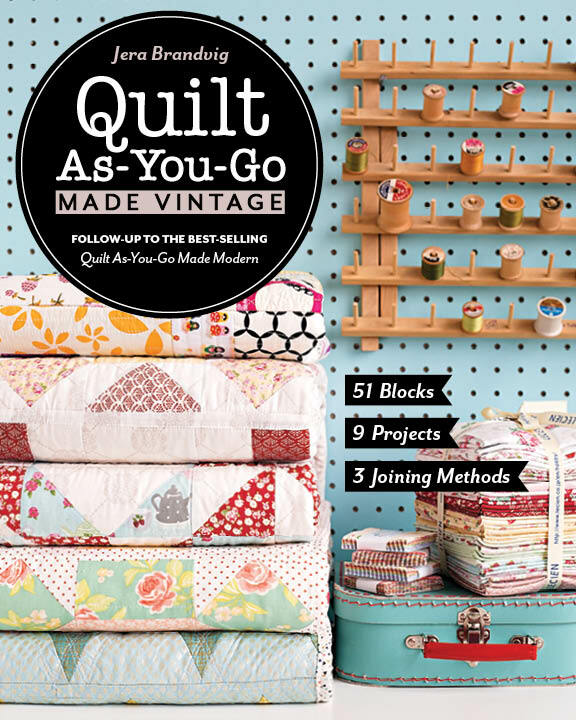 Love your new line and all your quilts. 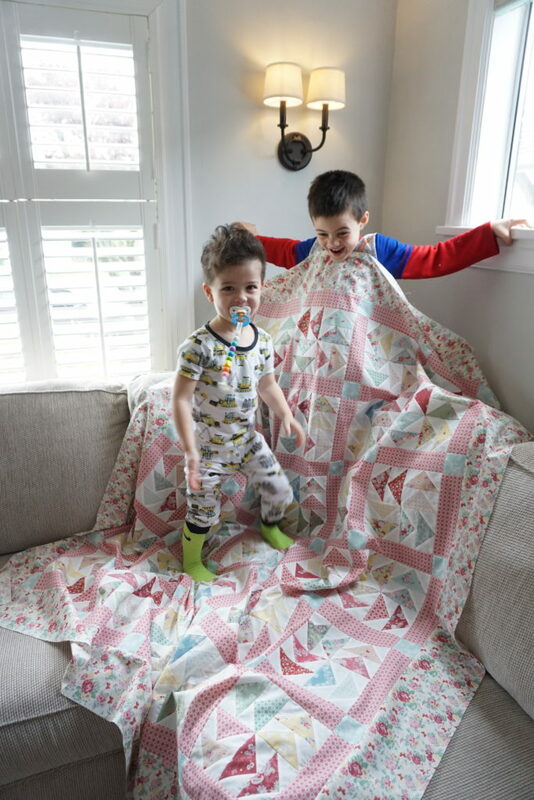 And you are such a sweet mom for giving up your sewing space for those sweet boys. ? Hey Kristin! Thanks for your lovely comment. 🙂 Giving up that sewing space was inevitable…kiddos really do grow so fast! 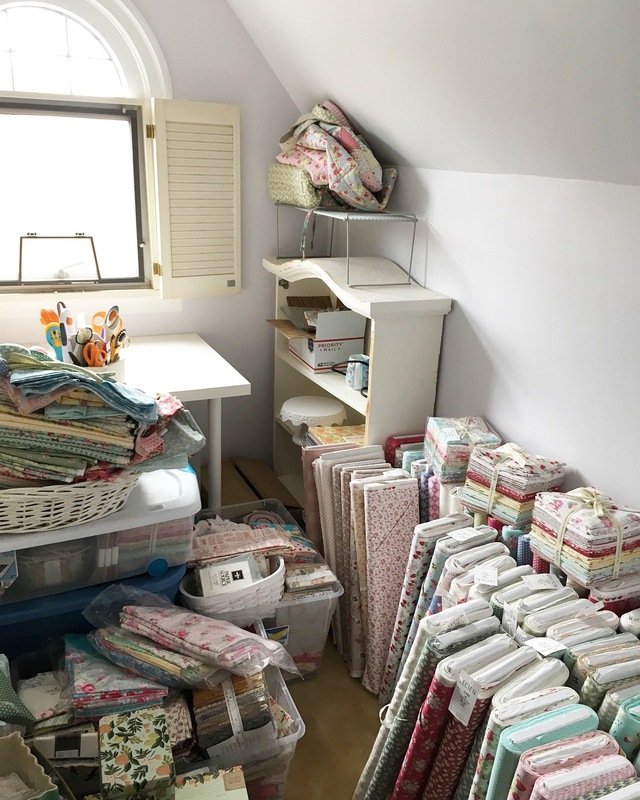 I’m happy i’ve finally made the move because the attic is where my sewing room was always meant to (eventually) be….it’s an odd-shaped room which is probably the best spot for my crafting room. It’s small, but i’ve always been used to small sewing spaces anyway. Happy sewing and keep up your awe-inspiring IG posts. 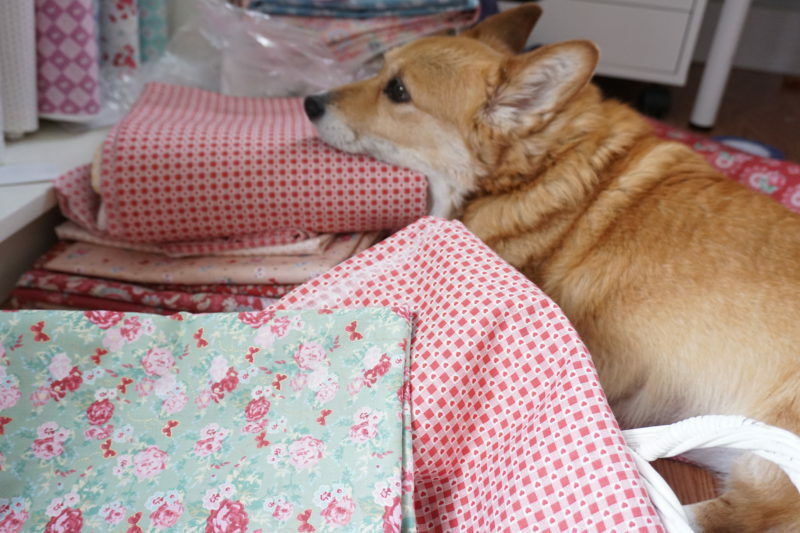 OOh my…lovely family, home, pup, and fabric!! Jera you have such an adorable family. Your fabric is beautiful and anytime you can show us northwesterners sunshine, flowers and lots of color, it is quilty related:) I live in Gig Harbor and hope someday to visit your area. Keep up the wonderful inspiration. Yay a new post..we have missed you! Woodland Rose looks beautiful, can’t wait for your site to re-open. Aww thank you! It warms my heart knowing people still read my blog, haha! I’ll make sure to do a blog post when my store reopens. 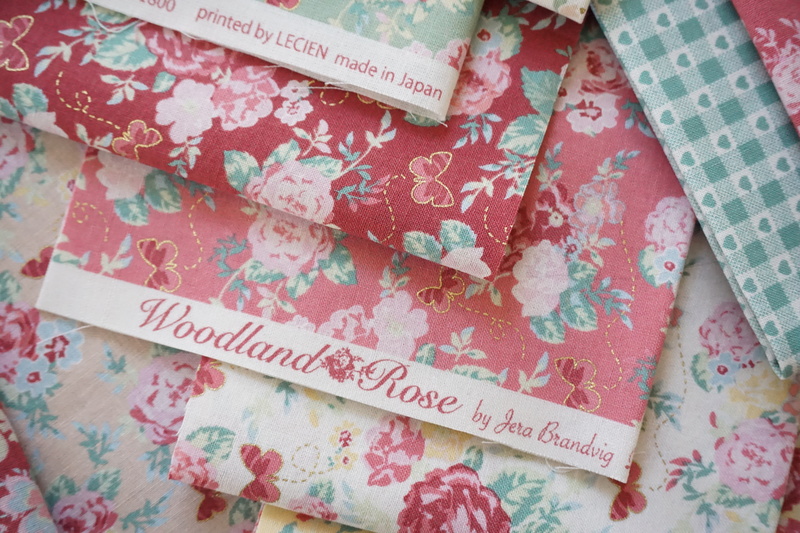 Your new fabric line “ Woodland Rose” is lovely. 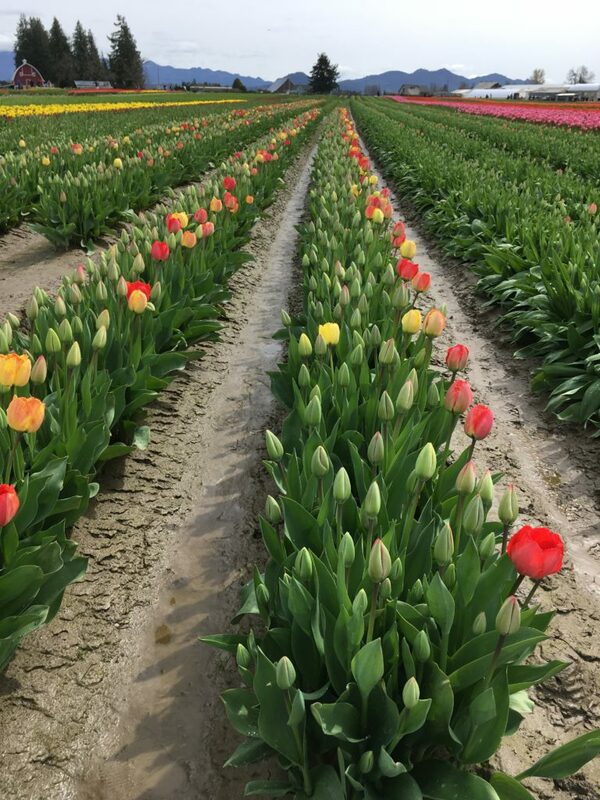 Your quilt models and Paige are adorable, and I loved your tulip field photos. love the fabric line! 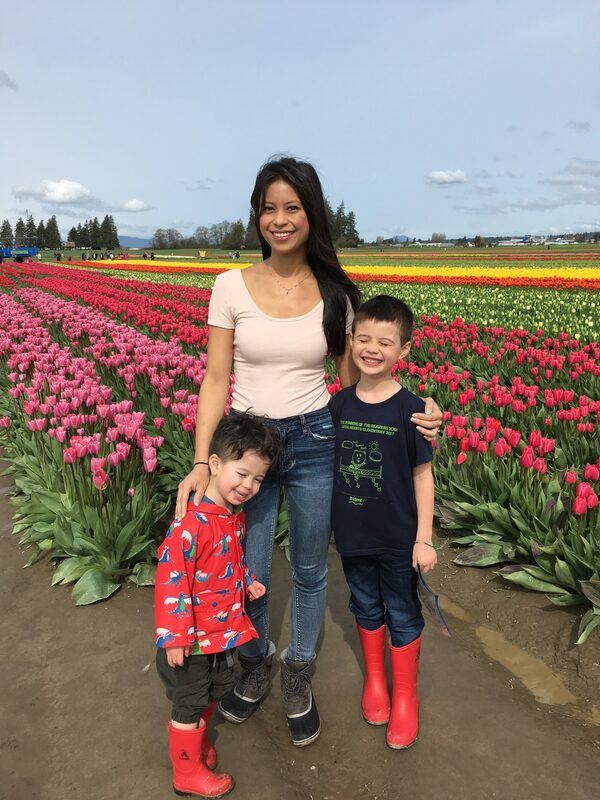 I especially love the pictures of you and your boys in the tulips. 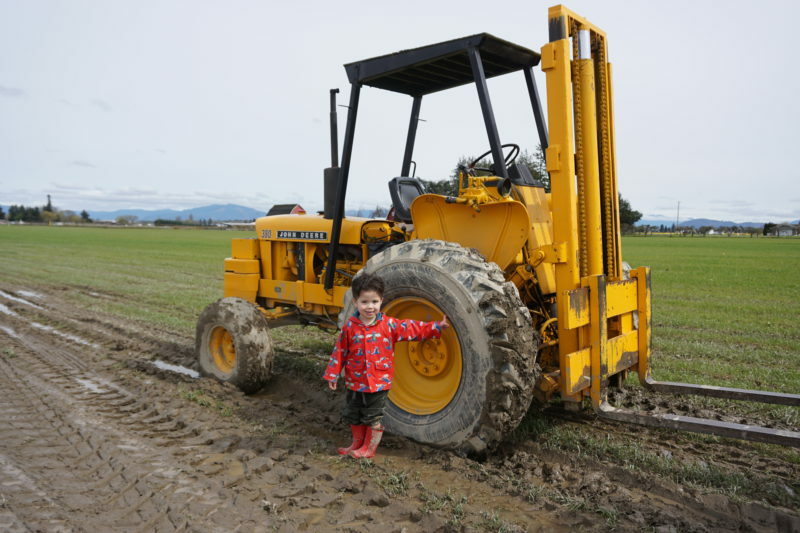 My family lived in Seattle for 6 years while hubby did grad school at UW and we ventured up to the Skaggit Valley one spring when our oldest was 2 1/2 and have some great pictures in those fields. I love it all. Your fabric , your kiddos , your puppy. Aww thanks for the love! Happy sewing from Seattle! 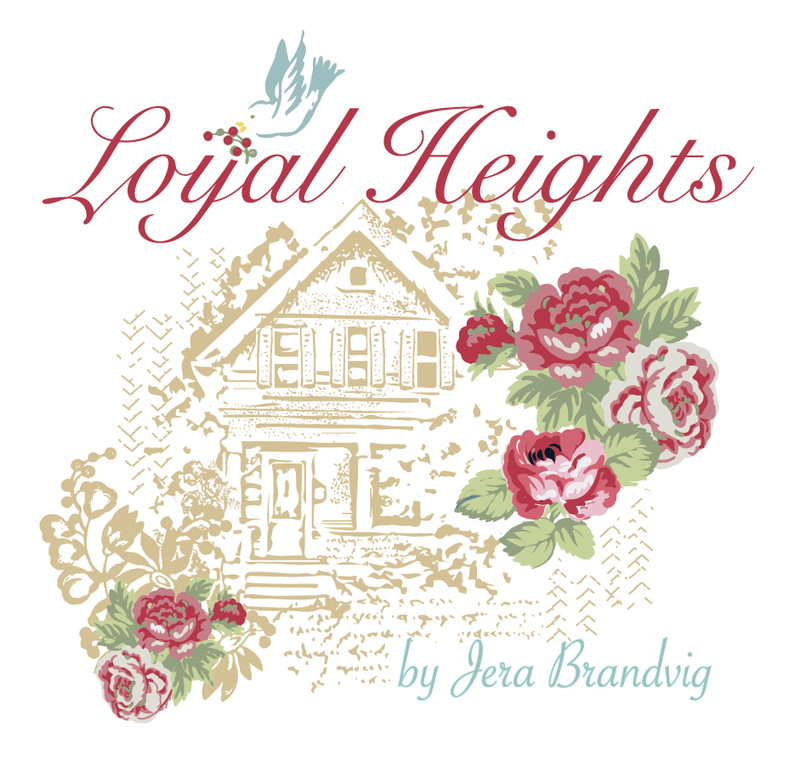 I loved this blog post Jera! 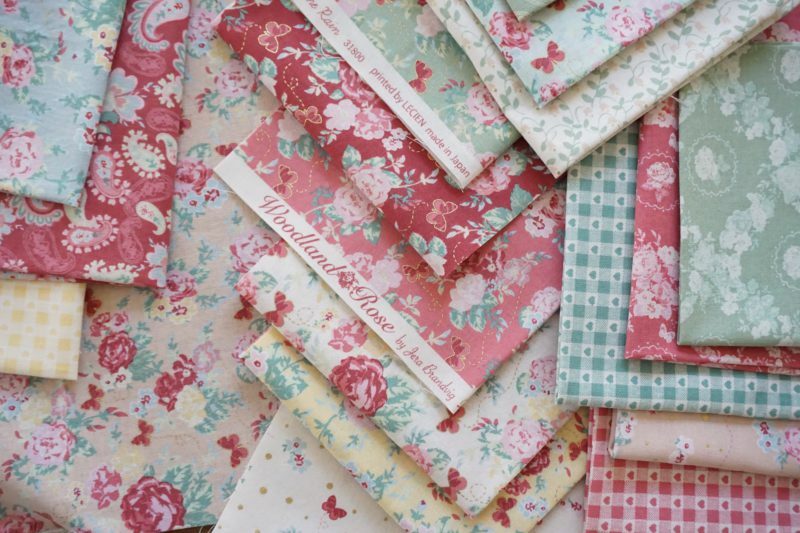 Of course you know how I feel about Woodland Rose…. it totally makes me happy! I think your attic space is going to be amazing. I can’t wait to see what you do with it! 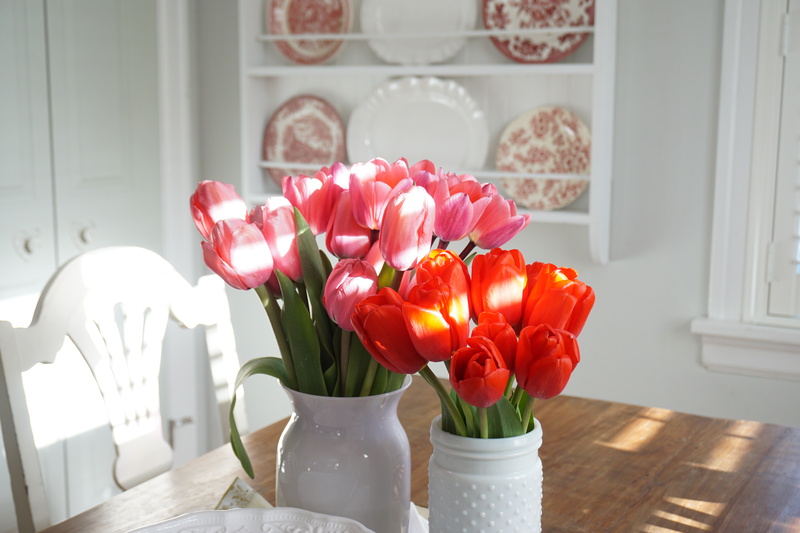 I get so much inspiration from those flower fields as well! So happy I could share it with you. 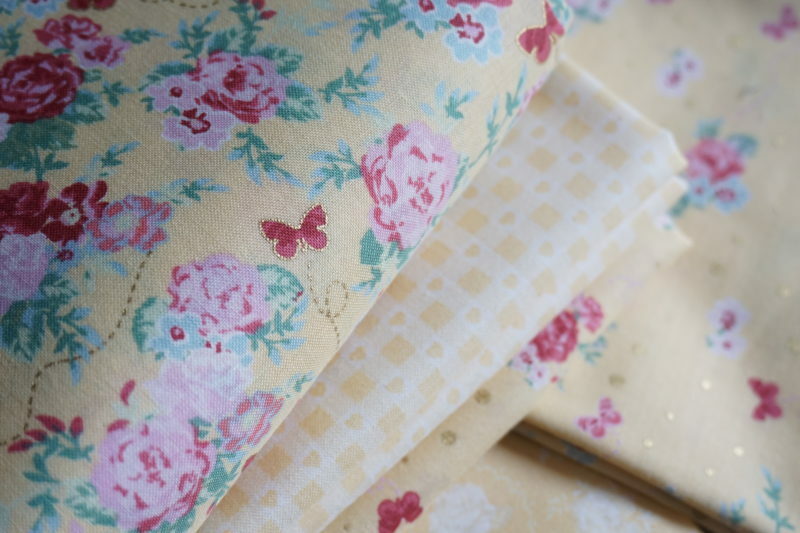 Thanks for the great catch-up post <3 I love your newest fabric line – wish it would be out sooner! I have your 2nd book & absolutely love it….and I always enjoy seeing pics from your home – I really like your home decor style <3 The bunk beds are what got me though…I had those as a kid & there's just something so cool about them – kinda like having a pirate ship! Your boys will certainly have a lot of fun on them. 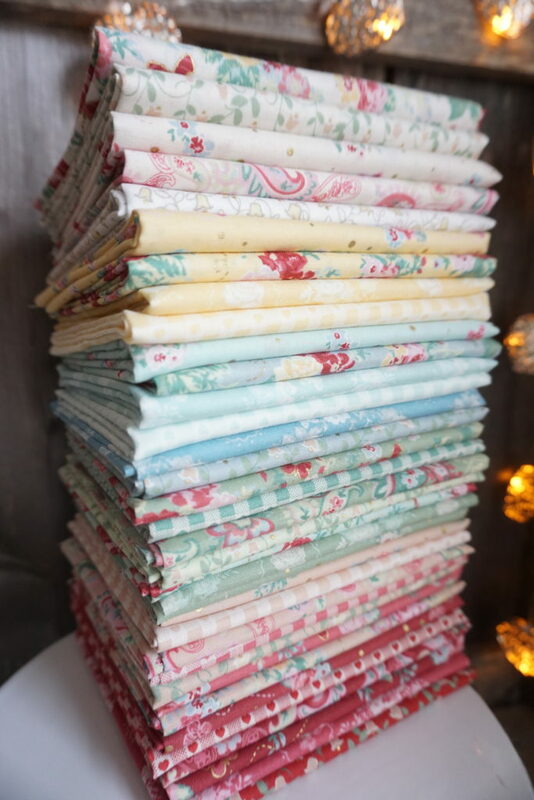 I just bought both your books and watched your YouTube on Quilt As-You-Go with LaConner fabric which I fell in love with and cannot find the entire line. I so want to make that quilt (and all your quilts with all your fabrics 🙂 ) I hope you will have LaConner available from “your stash” when you open your store again. I do LOVE your new fabric coming out. Can’t wait! Thank You for sharing patterns with us. Love them and the quilt as you go technique that helps us new quilters. I can’t wait to buy your new fabric line! 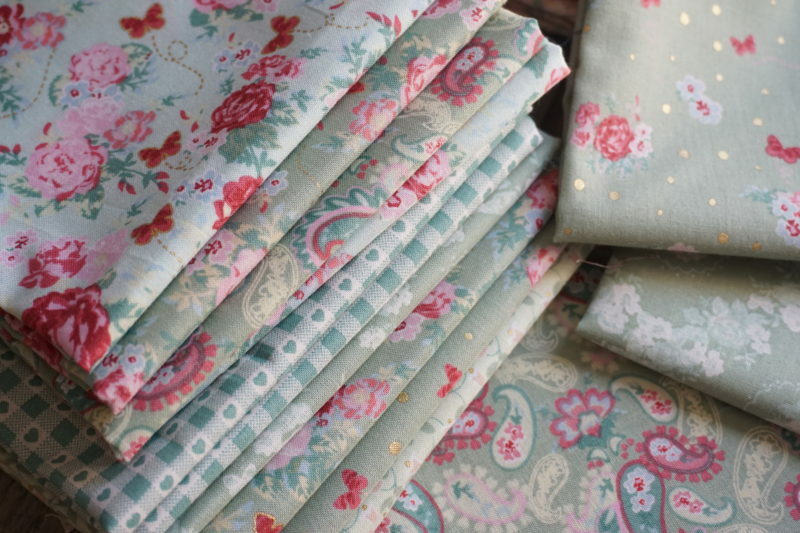 I love fabrics with metallic accents but your prints are just gorgeous! 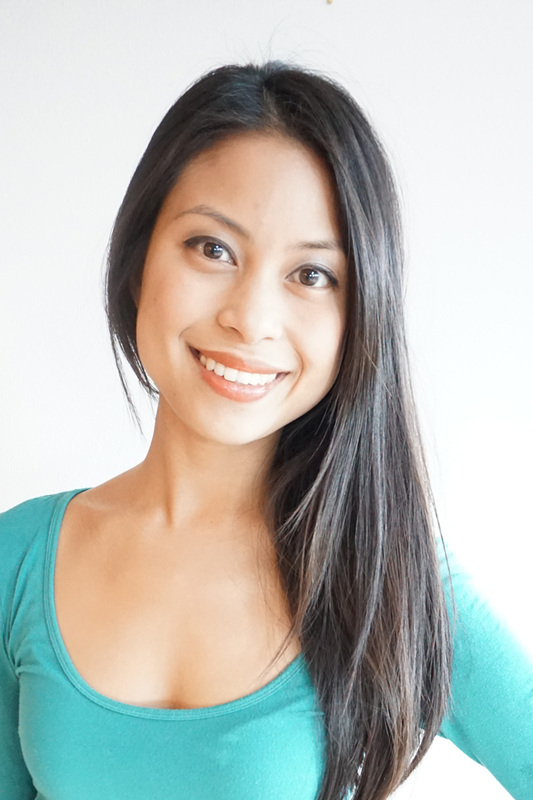 I love your blog and books! Am just about to start my first QAYG using your books! 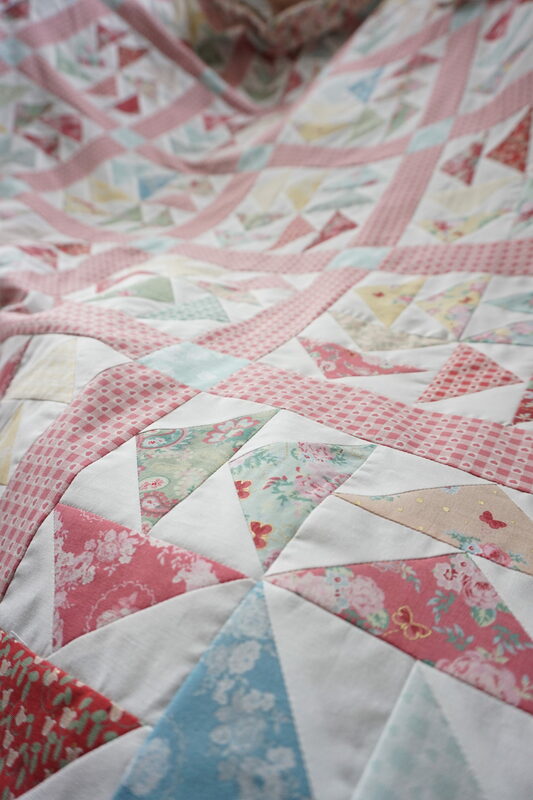 In Quilt as you Go Made Vintage, what fabric did you use for Java Java I LOVE that princess/fairytale fabric! Morning Jera, It has been a long while since I have stopped by. The youngest was just an infant. I can’t believe how big they are all getting and such handsome young fellas. Your sewing room is so lovely and clean. Inspiring, let’s see if it does me any good. Hopefully so, mine could use a little cleaning up. Absoutly love the new line, I have never been able to buy any of your lines befor and hoping to be able to get a little of this one, what sweet baby blankets this would make. Now I do have two of our quilting books so I would use a pattern out of one of those. Love our work. Have a beautiful day. Thanks for the kind words. 🙂 My sewing room looks clean, but rest assured I only share photos of the tidy areas, lol. I still have boxes I need to unpack after moving my sewing space up to the attic. I’m so sorry you haven’t been able to find my lines. 🙁 You can always find my stuff at Fat Quarter Shop. They will for sure have Woodland Rose. Have a wonderful Summer! Forgot to say I’m trying the cobbler and apple pie. Hubby is a huge sweet eater and these would make him happy. Thanks for the recipes.